August 21-22, 2010: This year the ASMA sanctioned the "Rabble in Arms" event at the Lake Champlain Maritime Museum and was where the very first ASMA sanctioned event was hosted in 2008. Six ASMA boats were on hand to work with the "Philadelphia II" which was crewed over the weekend by ASMA members. The event saw the relaunching of the gunboat "Syren", formally "Skweed" as well as the presentation of the ASMA "Onion Bottle" award to the crew of the "Dark & Stormy." July 9-10-11, 2010: The 250th commemoration of the Battle of the Restigouche took place on the Restigouche River in the towns of Campbellton, NB and Pointe-a-la-Croix, QC, Canada with eleven historical vessels in attendance, many of them ASMA boats and crews. As an ASMA sanctioned event, the ASMA "Onion Bottle" award was on hand and presented by the event organizers to the crews of the Shelburne Longboat Society. The Shelburne boats are the first non-ASMA boats to receive the "Onion" and this prompted them to seek membership in the ASMA. 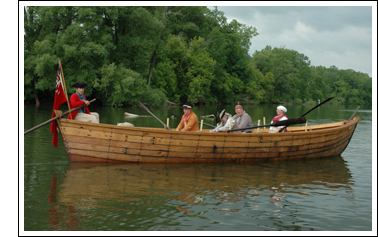 June 4-5-6, 2010: ASMA boats and crews participated in a Revolutionary War reenactment on the Mohawk River as part of the "Drums Along the Mohawk" event in the towns of Mohawk and Herkimer, NY. One dozen historical boats worked the Mohawk River thoughout the weekend, providing the public with a glimpse into the region's maritime past. As this was a sanctioned ASMA event, the ASMA "Onion Bottle" award was presented by the event organizers to whom they deemed represented the most accurate portrayal of a period maritime impression. 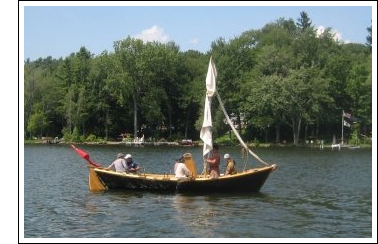 That honor went to the batteau "Moon," a 29' reproduction of an 18th century military batteau that was built to British Admiralty plans and recently completed by Scott Lance of Johnsonburg, NJ and his crew. March 22, 2010: The ASMA receives its formal 501(c)3 non-profit status from the IRS. February 21, 2010: The ASMA membership voted for the organization's 2010 sanctioned events which are now listed on this site's "Events" page for review and consideration.